Pap’s Genuine Beef Sticks is a new brand of meat snacks based out of Junction City, KY, started by a meat stick maniac named Rick Waldon. Waldon’s philosophy with beef sticks was to make them out of beef, and not “mechanically separated chicken” like many major brands. And instead of filling them up with soy and wheat fillers, he actually fills them up with, you guessed it, beef. Of three flavors available in Popper form, Grippo’s Bar-B-Q, Smokehouse Hickory, and Mild Smokey, we particularly liked the first two. Overall, you’ll find Pap’s Beef Sticks and Poppers with a mild, smooth flavor, quite unlike the greasy, fatty junk you get from major brands of sticks. 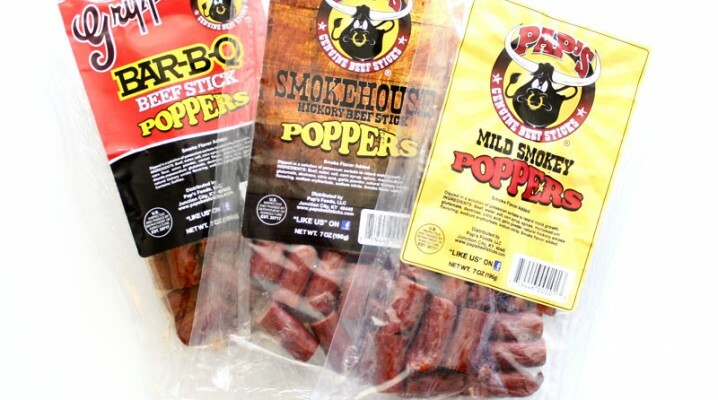 Pap’s Beef Sticks are currently stocked in convenience stores throughout Kentucky, Tennessee, Ohio, and Indiana. You can also buy them from their website. Because these Poppers are still very new, they haven’t quite reached the pixellized domain of Pap’s website, but I’m sure you’ll be able to order them there soon.